He missed 28 percent of his field-goal attempts and 3 extra points. The Giants spent the offseason restructuring their front office, rebuilding their coaching staff, overhauling their offense and redesigning their defense. Based on last season, all of those elements were in need of immediate updating. But one area that was just as disappointing in 2017 has remained the same. 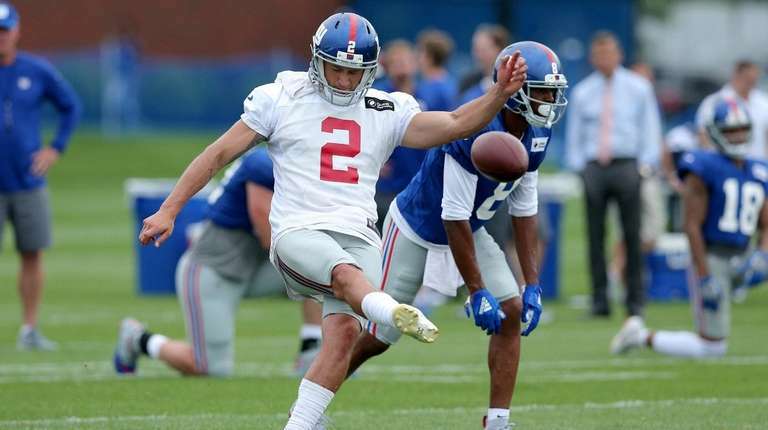 Aldrick Rosas is the team's kicker. Still. He returns after a shaky rookie campaign looking to prove that even though he’s back, the position has been upgraded just as much as any other area. Rosas made 18 of 25 field-goal attempts, with several misses coming in crucial moments early in the season when the Giants had an opportunity to change their course, and missed 3 of 23 extra-point attempts. His field-goal percentage (72.0) ranked 28th among those with at least 20 attempts and his extra-point percentage (87.0) was 33rd among those with 10 or more attempts. The confidence that the team has shown Rosas has helped heal any mental bruises that built up in 2017. They easily could have parted ways with Rosas after last season, or even brought in a veteran to compete with him the way Mike Nugent did last summer. Instead, they kept Rosas and added first-year kicker Marshall Koehn for training camp. That’s not to say it’ll be Rosas’ job when the season opens. There is still a long way to go until then, and while Pat Shurmur said he’s been pleased with Rosas’ work in camp, there are a few hurdles to be cleared. Rosas was perfect in preseason last summer, which won him the job. Once the season began, inconsistencies and insecurities began to creep in. It helps, Rosas said, to have a surprisingly familiar face working with him. The Giants brought back former special-teams coordinator Tom Quinn over the summer as an assistant to new coordinator Thomas McGaughey. Plenty of NFL kickers overcame disappointing rookie seasons, learned from them, and had fine careers. The Giants know that, which is why they have not given up on their young, powerful-legged project. Rosas knows that, too, and wants to be the next to be able to make such a claim.